Fig. 1. Illustrating two models of magmatic ascent and eruption on the Moon. Left: buoyancy-driven ascent. Melts rise based on relative density alone until reaching a level of neutral buoyancy (LNB, dotted horizontal line). Right: a continuous magma conduit can overcome LNB through the isostatic compensation within a regional source load. Fig. 2. Global average crustal density from GRAIL shown in color scale (legend in plot b, see text for model parameters) with areas of potential Mg-suite extrusion (black- filled regions). Grey-filled mare basalt regions were not considered in this study (see text for explanation). Melt densities are provided in each plot. a) The 1-atm Mg- suite plagioclase-undersaturated melt density compared to GRAIL crustal densities. b) The troctolite parent melt is less dense than the plagioclase-undersaturated Mg-suite composition and results in regions for potential eruption in the nearside southern highlands in addition to the SP-A basin. c) PSA parental melt with the greatest overall potential area for eruption within the nearside southern highlands and SP-A basin. Diamonds are PSA detections (Pieters et al., 2014), white-filled diamonds plot within areas considered in this analysis whereas grey-filled diamonds plot within mare-filled regions not analyzed. PSA detections at Moscoviense Basin and Thomson crater (whit-filled diamonds labeled with “V” and “T,” respectively) are labeled for reference, as are the Low-FeO igneous deposits at Maurolycus and olivine-rich exposures within Schrödinger basin and Zeeman crater (white-filled circles labeled “M,” “S,” and “Z,” respectively). 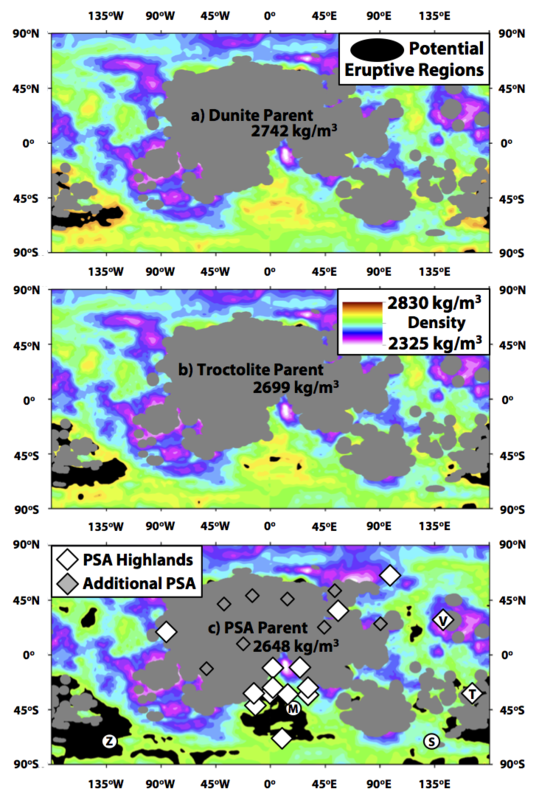 The strong correlation of PSA detections (Pieters et al., 2014) with results from this analysis suggests the nearside southern highlands region is the most promising area to search for possible Mg-suite volcanic and intrusive deposits.